The 2013 NFL playoffs got off to a great start with four exciting games on Wild Card Weekend. Here’s a few stats that you may not know from those games. 1. Three away teams won games on Wild Card Weekend, the first time since 2010. Since 1990, three away teams have won games on Wild Card Weekend in 2013, 2010, 2005 and 2004. 2. Kansas City’s 45-44 loss to Indianapolis was only the second time in playoff history that a team has scored 40 or more points and lost in the post-season. The other time? Green Bay lost to Arizona 51-45 on January 10, 2010 in a first-round contest. 3. The Cincinnati Bengals were scoreless in the second half of their loss to San Diego on Sunday. In games when they are scoreless in the second half, the Bengals are now 11-94 (.105 winning percentage) in their history. In the Super Bowl era, the Buffalo Bills have the worst record in games when they are held scoreless in the second half. They are 8-106 (.070 winning percentage). 4. The Colts gave up 31 points in the first half of their game with Kansas City. With their win, they became only the fourth team in the Super Bowl era to win a game after giving up 31 or more points in the first half. From 1966-2013, teams are 4-264 (.015 winning percentage) when they give up 31-plus points in the first half. Prior to Indy’s win on Saturday, the last team to win a game after giving up 31 or more points in the first half was Buffalo on November 21, 2010. The Bills were behind 31-14 at half and went on to defeat the Cincinnati Bengals 49-31. 5. The Colts had four turnovers in their game with KC. It was the first time that a team with four-plus turnovers has won a playoff game since January 11, 2003 when the Tennessee Titans won a playoff game with four or more turnovers. Playoff teams are now 24-141 (.145 winning percentage) when they commit four or more turnovers in a contest. Pittsburgh, Dallas and the Raiders have each won three playoff games since 1966 when they had four or more turnovers, most in the league. 6. Indy QB Andrew Luck had four touchdowns and three interceptions in Saturday’s win. It was the first time in NFL playoff history that a quarterback had four TD passes and three interceptions in a game. It has happened 46 times in the regular season, with those QBs winning 24, losing 21 and tying one game. Peyton Manning leads the way with three games with 4+ TDs and 3+ interceptions in the same game. 7. Indianapolis’ 45-44 win over Kansas City was the first time in NFL playoff history that both teams scored over 40 points in a one-point game. It has happened twice in the regular season in the Super Bowl era: On October 17, 1983, the Green Bay Packers defeated the Washington Redskins 48-47; and on October 19, 1986, the Kansas City Chiefs beat the San Diego Chargers 42-41. 8. The New Orleans Saints were losing 7-6 at halftime to Philadelphia in their Wild Card game on Saturday. Prior to that game, the Saints were 40-156-2 in games where they scored six or fewer points in the first half. This win was their second in a playoff game where they scored six or less in the first half. The other game? The Super Bowl on February 7, 2010 when they went into halftime losing 10-6 to the Indianapolis Colts. They won that game 31-17. 9. 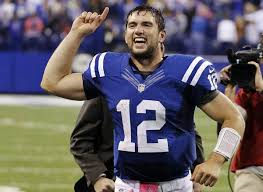 The Colts’ one-point win was the 15th one-point victory in the NFL playoffs in the Super Bowl era. It was the first one-point win in the postseason since the Jets defeated the Colts 17-16 on January 8, 2011. The San Francisco 49ers are the only team to win more than one one-point playoff victory … they have three. Dallas, Kansas City and the New York Giants have each lost two one-point playoff games in their history since 1966. 10. New Orleans kicker Shayne Graham had four field goals in the Saints 26-24 win over the Eagles. It was the first time a kicker had four or more field goals in a playoff game since … Shayne Graham had four in Houston’s 19-13 win over Cincinnati in the playoffs last season. It was the 28th time since 1966 that a kicker had four-plus field goals in a playoff game. Graham is now one of four kickers to have done this twice in their career. The others: George Blanda, John Kasay and Adam Vinatieri.